190. But why play with others when it’s so much more cool to be a loner misfit? 191. Hey! A wolf! I told you we’d get there. But I have to say: coloring in wolf fur is a pain. It’s so dense and multilayered that wolves can sleep uncovered in a snowstorm and not freeze; the under-layer keeps them warm during the cold months, and the top layer is the long, coarse stuff which verges on waterproof. This particular wolf is already putting on its autumn fur. Which should tell you something about how cold that water is. 192.“The Beloved Disciple” (or the “disciple whom Jesus loved”, etc) is a Biblical figure who appears only in the Gospel of John, the gospel that doesn’t follow the same storyline or sources as the other three. This disciple is never named, but is often referred to as “John” because one of the gospel’s chapters suggests that the work is derived from that disciple’s account – although scholars tend to agree that the gospel was written nearly a century after the actual death of Christ. This beloved disciple can seem like a short of shadow character, or even a stand-in for the reader; a sort of biblical Mary Sue. (I suspect that the author Christopher Moore got his hilarious novel “Lamb: The Gospel According to Biff, Christ’s Childhood Pal” out of this notion.) He and the disciple Peter get most of the attention from Jesus in this chapter, including a dramatic race together to the empty tomb. 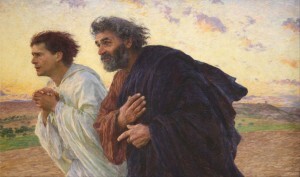 Eugene Burnand, a 19th century Swiss painter, is best known for his depiction of this moment, The Disciples Peter and John Running to the Sepulchre on the Morning of the Resurrection, which can be seen at the Musee D’Orsay. 193. Riesling is a German white wine grape that can turn out sugary or dry depending on what you do with it. Either way, it goes down easy, as Luther is about to discover. And yes, for panel 2, I acknowledge: I put a “that’s what she said” joke into this comic. 196. Whoops – how’d that happen? The Enlightenment, unlike, say, “The Dark Ages”, was actually thought of as ‘The Enlightenment’ while it was still underway – the term starts popping up in English by the mid-18th century, and the German-speaking participants had already been calling it der Aufklärung for awhile and probably getting it printed on t-shirts. The fancy and educated classes knew quite well that this was a major societal shift, and for the most part everybody was very proud of themselves. Meanwhile the infant mortality rate was still at about 50%, but hey! One thing at a time. 199. They’re making a Rousseau joke here. As I’ve noted before, there was plenty of nattering about what life was like in a State of Nature – from Hobbes saying it was “nasty, brutish and short” to Rousseau claiming it was man at his purest. The next century would feature the Romantic movement, in which nature was both dark and pure. All of which is great material for hangover barf jokes. That cheerful little two-headed fetus skeleton is an illustration from a 1720’s French medical illustration textbook, and the creepy subject matter means you might run into it at many a Goth-oriented print shop. It’s by Philippe Simonneau, an engraver and book illustrator who worked on many Enlightenment-era academic treatises. The Professor of Medicine is calling Ariana a timelessly misogynistic word, which I won’t translate for you because I want you to have a nice day.